These doors open directly into the Collective. Most are used by residents and outside renters of internal work-spaces: workshops, studios, offices in the basement, ground-level, mb-L1 work-zones. Two exclusively by residents. 165B: Used by residents and outside workers, the Tetterode Co. main admin entry opens into their grand reception hall and accesses their erstwhile offices (now the N-End workshops); then via a passage, to the Dacostakade buildings (mb/hc) and the Dacostakade entry 158. This is the only internal route across the whole site - I refer to it as the 'N-end passage'. 163: Gives access to the bdN-enclave entry; then to a residents' stair up to an isolated apt in bd-L1/eN; to the rear entries of bd-L2 and bd-L3 enclaves, and finally the bd roof. North of 163 there are 5 doors that appear to serve the 5 street-front apt and workshop bays of this north extension of the Bilderdijk old building [bdN]. In fact they are stairs to the private flats above these and the Collective's bdN enclave is accessed from the 163 entry-passage. 164: The residents' door serving the stair (and now defunct lift) at the Hartcamp building's south-end. Less used than 158, it climbs past the rear entries of the Hartcamp residential enclaves (hc-L1 to L5), past the 'front-door' of L5's isolated apt, and up to the terrace of the L6 penthouse. 162: The Tetterode Co. main factory entry and the only vehicle entry opens via a tunnel directly into the Courtyard. Used by residents or outside workers. 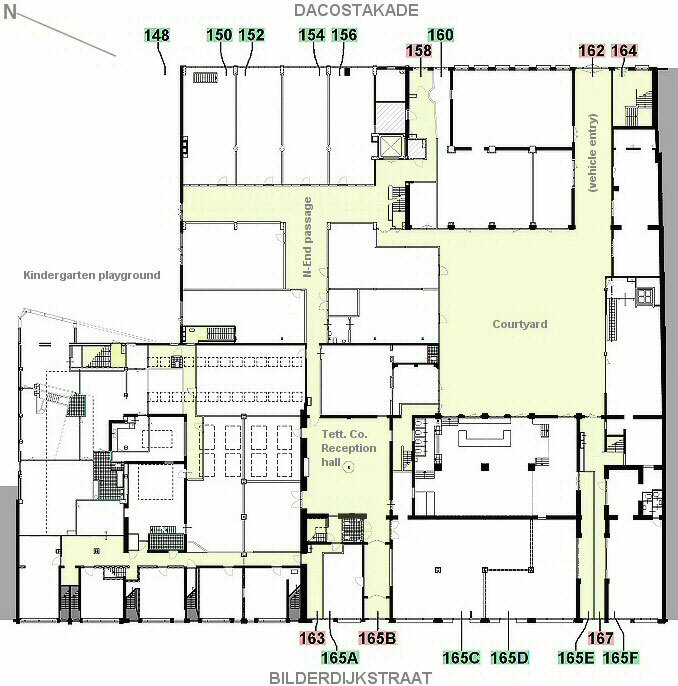 158: The residents' door into the Dacostakade buildings' main stair/lift foyer, plus a branch to the Courtyard, and - via the passage from the Tetterode Co. reception hall - to Bilderdijkstraat entry 165B. Though 'cul-de-sacs' to their customers, almost all these public-service spaces have rear exits that allow their renters the same access to the Collective's facilities as renters of the more internal types of basement / ground-level / mb-L1 work-spaces. 148: Kindergarten school. [Run by outsiders and independent from the Collective - the site was given by Tetterode squatters in 1990].